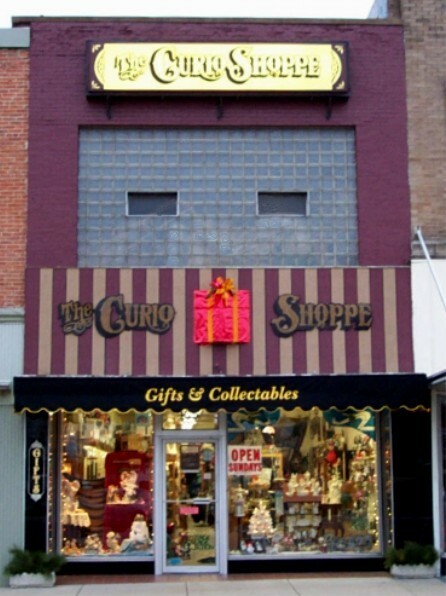 The Curio Shoppe has a wide variety of "Legends" collectibles. Here is a sample of what we offer. Vacant Thunder,Western Memories Premier Edition - 15"H - A Sioux Indian, in authentic buffalo headdress, reflecting on his life and how times have changed. Upon slipping a buffalo robe around his shoulders, this Sioux warrior is reminded of his younger days when the herds were abundant and roamed fre on the open prairie. 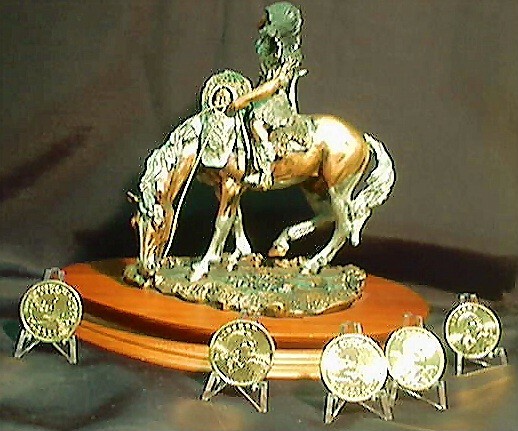 His memories are elegantly depicted from the intense emotion that exudes from his face, to the expertly crafted relief of wild buffalo roaming the land on the skin of his buffalo robe. 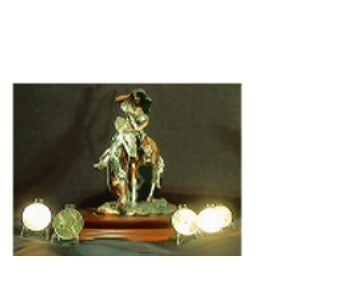 Sacajawea, Legendary West Collection - Sacajawea is remembered and respected for saving the Lewis and Clark expedition various times. As a Shochoni Indian child of eleven, Sacajawea was captured by an enemy Indian tribe and taken to the Dakotas. As fate would have it, she was then sold to a French-Canadian trader and guide by the name of Toussaint Charbonneau. In 1804, Charbonneau was contracted as a guide by the Lewis and Clark expedition. Sacajawea and her newly born baby accompanied the expidition. She acted as interpreter, taught the men to find edible roots and medical herbs, pointed out landmarks, familiar to her from childhood, made buckskins and moccasins, and was more valuable an aide than her husband. While canoeing down river rapids, Charbonneau and Sacajawea's canoe capsized. Sacajawea dove underwater and single-handedly saved the Lewis and Clark expedition's records. 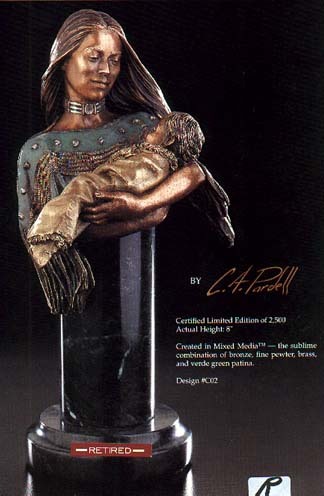 Sacajawea represents the strength and resilience that was often exhibited by the Native American woman of the 1800s.